Feel Like Taking a Hike? It’s almost spring which means folks will be ready go get outdoors once again. 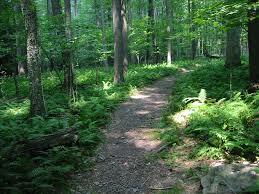 We have a lot of hikers in this area, so they are always looking for great hiking trails in the area. The Natural Areas Division has nearly 50 miles of trail available for hiking, trail running, mountain biking, and horse riding and they have put out a complete list of hiking trails in and around Louisville. Jefferson Memorial Forest offers over 35 miles of scenic woodland trail for hiking, trail running and eleven miles available for equestrian use. Additionally, the Tulip Tree and Memorial Trails are handicapped accessible. Waverly Park offers over eight miles of multi-use trail for mountain biking and hiking. We invite you to explore these and other Natural Area Division trails. When exploring the map links below please note that trails in Jefferson Memorial Forest and Waverly Park have location numbers mounted on posts which correspond to those locations on the maps. Distances are indicated between trail junctions on the map and provide you the opportunity to plan your own individual trip and be able to calculate the route distance. There is no shortage of great hiking trails in and around Louisville.